Babies are the best. They’re cute, they’re pure, and have all the potential in the world. We can also dress them up all cute and adorable while what they wear is our choice. But as soon as the afternoon feeding comes up, you’re going to want to be prepared. Yeah, we’re talking about spit-ups, drooling, and maybe even projectile vomiting (yikes!). One of the commandments of being a mother of an infant is that you never, EVER, leave the house with your baby in a clean outfit with no bib. The perfect baby outfit can easily be ruined from getting soaked, making those potential Instagram or Facebook posts questionable. This is why bibs play such an important role in the early years of our children. Bibs are useful not only for newborns and small babies, but they can also easily be used through the toddler years – up until 4 years old. The thing about bibs is there are good bibs, and there are bad bibs. You don’t want to end up with a bib that has a poor velcro fastener that’s worn out and doesn’t even work anymore. It’s also important to use bibs that can help protect your child’s clothing and skin from getting soaked, causing an undesirable drool rash. This is where the skin on the chest is in contact with wet clothes for long periods of time. Now that we’ve covered a brief overview of why your baby needs bibs, the different styles, and what to consider, it’s time to get into the best bibs of the year. We have reviewed a variety of bibs, considering their different styles and utilities as well as including different price ranges. These bandana bibs are super soft and cute. You get neutral shades so these are suitable for both boys and girls. With 100% organic cotton, you can’t go wrong. They’re comfortable and good for your baby to wear. Use these bandana bibs to keep your baby’s drool at bay. They’re a functional accessory since they can catch drool and pull off being an adorable accessory. Thanks to the high-end cotton, these bibs have a high-end look. Your baby is sure to love the animals imprinted on these bibs just as much as you will! Not all toddlers are quite ready to move on from bibs just yet. In fact, most children are pretty messy eaters into their elementary school years. The BabyBjorn Soft Bibs were made specifically for toddlers. Being made of thermoplastic elastic rubber and propathene, these bibs are durable to withstand any food it comes into contact with. The bottom has a compartment pocket that can catch inevitable spills and food to keep your child and their area at the table a bit cleaner. Washing this bib is also very easy since you can place it right into the dishwasher. This has got to be the best bib for toddler feedings yet. The Neat Solutions 10 Pack Water Resistant Drooler Bib Set has got to be the best bang for your buck. For less than $10, you get a pack of 10 bibs. Not just that, but they’re water resistant! They’re easy to secure with durable velcros. The thin design is non-invasive and can be tucked away with ease during feedings. Being constructed of 75% cotton terry cloth and BPA/PVC-free plastic for waterproofing, you’ll be able to count on these bibs at any time. Since there are 10 in this pack of bibs, you can pack some in your diaper bag, keep some in the kitchen, and store some in your baby’s room for convenience. Another 10-pack bib set is the Luvable Friends Baby Bibs Value Pack. The soft, cotton & polyester fabric is gentle for your baby’s skin and perfect for catching spit up. With absorbent terry, you can be sure their clothes don’t get soaked in unsightly drool and the milk from that morning. Pop these bibs in the washing machine for cleaning and don’t feel bad if any get ruined since you get a pack of 10. Keep a few in every room of the house so you never have to worry about not having a bib ready in time. Our final bib review is of the Skip Hop Zoo Little Kid and Toddler Tuck-Away Water Resistant Baby Bib. This velcro fastening bib comes in many cute designs including ladybug, butterfly, cow, monkey, giraffe, dog, and more! Choose a few of your baby or toddler’s favorite animals and they’ll have no problem with wearing a bib at dinner time. Classic bibs are best suited for small-medium amounts of baby drool. They feature the standard bib shape and are optimal for the 6 month-2 year range. Use them confidently for feedings on a day to day basis. Drool and bandana style bibs are distinct because of their triangle shape. They either clip or fasten and may make your little one look like the cutest cowboy on the block. Drool/bandana bibs don’t offer as much coverage. Because of this, they’re best suited for managing drooling, especially due to teething. If you’re looking for something suited for messy eaters, then a silicone bib may just be the solution to your inconvenience. 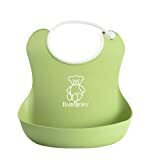 These bibs are made of food-grade silicone and scoop up at the bottom to help catch spills and food. Cleaning them can be done by washing them with the dishes, or better yet, throwing it in the dishwasher! A full coverage bib offers a lot of coverage compared to your standard bib. These have sleeves, are longer, and are suited for the messiest of children. Also known as smock style bibs, these will commonly be made of plastic materials that can be wiped down. This is a better option for an older child who doesn’t want to wear a bib despite being messy. Is there enough room for your child’s neck? Is it the right size? Too small won’t protect enough while too big may not be aesthetically pleasing. Does it fit into your budget? Do you think it’s cute? The “catch-all” food pocket makes this the perfect bib for feeding whether your child is an infant or a toddler. This bib’s material is water-resistant and lightweight. You can machine wash these bibs on cold and allow to air dry. 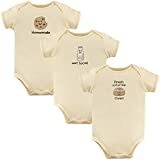 With such adorable designs, all parties involved in the wearing and putting on of these bibs should pose no problems if you’re little one tends to fuss about bibs. Thank you so much for the information. I am writing an article on baby bibs and your article is really helpful. It clarifies all my doubts.